There is nothing like a glass of freshly squeezed orange juice, especially in the morning. Buying the oranges at a farmer’s market and juicing them in my Omega Juicer tastes like heaven. Sometimes, I even add a grapefruit or a lemon. Last week, as I was enjoying my homemade juice, I thought how store-bought juice tastes so different. I don’t always have the time to make my own and wanted to know how it compared in terms of the ingredients and process. The truth about commercial orange juice is shocking, but thankfully, there are some good companies out there to save you when you don’t have the time to make your own. If you are making your own orange juice, which is without a doubt the best choice, make sure you buy organic oranges (avoid pesticides) and use a cold-pressed juicer like my Omega Juicer because it is the best way to preserve all the nutrients. Fresh, raw OJ made at home is packed with antioxidants, vitamins, minerals and enzymes. Juice and serve right away. A fresh, delicious and sweet treat! Just be careful and limit your juice intake. Remember it takes several oranges to make a glass of orange juice, and that means it contains fructose. Drinking orange juice in moderation is perfect for your health because oranges have amazing benefits. I have been doing a lot of research about commercial orange juice and found some pretty interesting information. For example that Pepsi owns Tropicana, and Coke owns Minute Maid and Simply Orange (I used to think Simply Orange was super healthy). They both produce about 60% of the orange juice in America. Of course, without any further explanation, you should stay away from anything Pepsi and Coke produces. Orange juice is sometimes made from concentrate, meaning oranges (after pasteurization which kills enzymes and nutrients), are heated down to evaporate nearly all of the water. You know that oranges are seasonal and producers need to make juice all year long. This is a convenient and cheap way to store the concentrate for very long periods of time. Then, several months later, the concentrate is mixed back with water to make juice. Chemicals, refined sugars (most likely from GMOs if the juice is not organic), and other added flavors are also included in the process to reconstruct what they sell as orange juice. It doesn’t sound anything even close to fresh or real to me! The good news is you can still find good alternatives and enjoy real orange juice. Orange juice goes really well with most fruits and vegetables too. Use it to make delicious ice pops for dessert or a snack, please see my post Great Snack Idea: Ice Pops. You can also use orange juice as your base for your green smoothies. It is a great way to get kids to eat more vegetables! Please also check out my Green Smoothies Recipe for more ideas. How do you choose a good commercial orange juice? Starting with the basics of choosing an orange juice that is 100% juice and not from concentrate. There are some pretty bad choices out there that only contain 10% juice and the rest is just water and various forms of fructose (most likely from GMOs if not organic) and other chemical additives. That is definitely not what I want in my orange juice. As always, it is so important to read labels and be well informed to choose the best products available. The less ingredients, the better because it means the product is less processed. For more information about how to avoid processed foods, please see 7 Ways To Avoid Processed Foods. I had an interesting conversation with a friend who actually works for an orange juice producer in Florida. She told me some countries in Europe and Latin America won’t even consider importing orange juice from concentrate. It is just amazing to me that we still buy cheap juices from concentrate here in the US. Why do we have lower standards? Now that you have your 100% orange juice not from concentrate, choose a brand that doesn’t add flavor packs. Orange Juice producers came up with a process (deaeration), to keep them for a long time without having to use concentrate. After the oranges are squeezed,the juice is heated to eliminate bacteria (pasteurization). Then the juice is stored in giant holding tanks and the oxygen is removed from them, which allows the liquid to keep for up to a year without spoiling. The process also makes the juice lose its taste. So companies use “flavor packs” to re-flavor the juice. Fragrance companies responsible for making perfumes like Dior and Calvin Klein, are the ones hired to also create a fragrance formula for your orange juice. This is the reason why your favorite commercial orange juice tastes the same each time you drink it. Want to drink some Eau de Ocean Spray? So even when it says, “100% orange juice,” and the label only has one ingredient (orange juice), the juice is likely to contain flavor packs. The reason? Flavor packs don’t need to be included on the label. Isn’t it scary? This is why you need to know which brands add fragrances. After some research, I found out I should stay away from the flavored liquid Tropicana, Minute Maid, Ocean Spray, Florida’s Natural, and Simply Orange. They all use “fake fragrances” to imitate the taste of real orange juice. 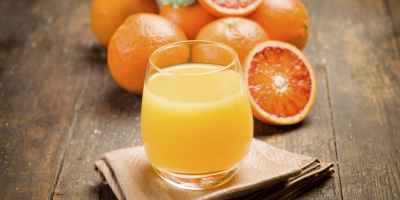 Avoid orange juice that contains added sugars. Oranges are already sweet enough so I don’t understand why the juice needs more added sugar to begin with. Organic versions will not contain GMOs but still why not keeping the orange juice natural? Some juice companies go as far as adding sugar that could be from GMO sugar beets or corn (high fructose corn syrup). Tropicana, Ocean Spray and Minute Maid are huge offenders and full of GMOs. No wonder why they gave millions of dollars recently in Washington to stop GMO labeling. Many juice companies also add vitamin C in citric acid form. This helps extend the shelf life of their product and also makes it appealing to consumers because their orange juice has no natural occurring vitamin C left after being so highly processed. The problem is the majority of citric acid doesn’t come from natural food sources, it usually comes from GMO corn. Citric Acid is made synthetically in a lab. You can read more about it in my post Homemade Non-GMO Vitamin C Gummies. The recipe is great as a natural supplement and with the combination of a good source of collagen it will bring lots of health benefits. Did you know that your body can’t actually assimilate and produce collagen without vitamin C? My Vitamin C recipe comes only from whole food sources and with a good source of collagen, it will support a healthy digestive system, strong bones & teeth, and more. Uncle Matt’s.- This company is committed to supporting family farmers and helping farms convert to organic. 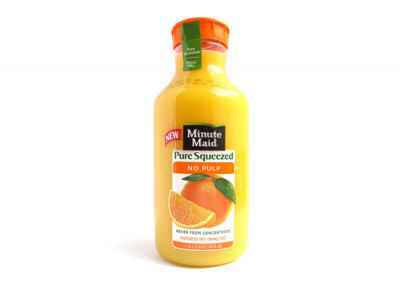 I love Uncle Matts Organic Orange Juice and this is usually what I buy when I cannot make my own. A small Florida family company I like to support. They only flash pasteurize their juice to preserve more nutrients. Whole Foods.- Their organic orange juice is also a great choice. Another reason why I like to shop at Whole Foods. Just make sure you choose the certified organic type. Whole Foods is also committed to provide good quality products and avoid dangerous additives. Suja Bliss.- Suja, meaning long, beautiful life, embodies the promise that flows from the cold-pressured beverages it delivers in each and every bottle. Suja was founded by four diverse San Diegans that came together to form what is now the fastest growing organic, cold-pressured and Non-GMO beverage company in the U.S. The company dreams to help people transform their lives through conscious nutrition. Their OJ is only available in small bottles. Evolution.- In my opinion, their juice tastes very real. Evolution orange juice only comes in small bottles. Their oranges are packed with vitamin C and are picked and squeezed at the peak of sweet flavor. Made Cold-Pressed using High Pressure Processing. No heat pasteurization. Indian River.- Another great company. Indian River is a family-owned company located in the citrus-rich Indian River region of Florida. Their 100% premium juices are made the old-fashioned way using handpicked, peak-season Florida oranges and grapefruit. Uses a gentle pasteurization process and cold- filled to ensure food safety and maintain fresh taste, aroma and nutrients. There is a great book out there called:Squeezed: What You Don’t Know About Orange Juice by Alissa Hamilton. She explains what the industry has done to orange juice in great detail. If you are interested in learning more about the orange juice industry, take a look also at The American Nutrition Association article. You will find very interesting information. Making you own orange juice is unbeatable but now you have good alternatives when you don’t have the time. Being informed and making better choices for my family is my number one priority. The good news is you can still enjoy an organic non-gmo, real orange juice even if you are not making it at home.